“We had lost our footwear in previous skirmishes; but we still had our ‘kuppies’, the cyanide capsules we wore around our necks. We were better prepared for death than for life.” This is what a 17-year-old child soldier holding the AK-47 thought to herself while moving forward to escape soldiers in an ambush. 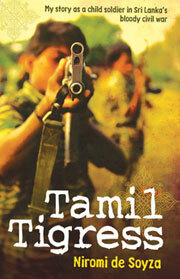 After 25 years, this child soldier gives the world a fine insight into the early stages of Tamil militancy and what influenced thousands of youth to sacrifice their lives a cause, through her 300-page book, The Tamil Tigress. 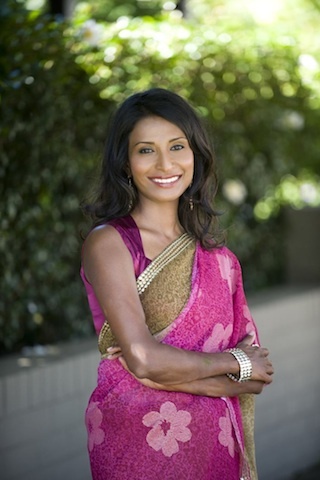 She, now a professional, a mother of two and living in Australia, relates her story as a child soldier in Sri Lanka’s bloody civil war. Her book is now being included in the list of 50 books by the Australian Ministry for the Arts as ‘one of the books you can’t put down for 2011 – 2012’. Here, the ‘Tamil Tigress’ speaks. Giving her first local newspaper interview to The Island, Niromi de Soyza, who writes under a pseudonym, says she learnt about non-violence in a hard way and believes the American novelist Tom Robbins’s saying: ‘There are many things worth living for, a few things worth dying for, but nothing worth killing for’. Q: What is your memory of Jaffna, its people and your childhood? A: I describe this in quite a lot of detail in the book. 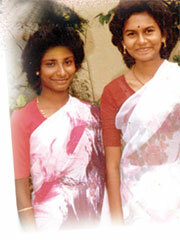 I had an idyllic and carefree childhood in the Hill country where I was born and moved to Jaffna town after I turned 8. Although life in the north was different in many ways due to its conservative culture and emphasis on education, I still had an enjoyable time. But when I was around 11 years old, the library was burnt down. It had been my favourite place to visit in Jaffna, even more than the Subramaniam Park or Casuarina beach! Everything changed after that. My environment became serious and gradually descended into anarchy by the time I was a teenager. Q. Who were your role models? A: Although born a whole decade earlier, the great Indian poet Subramaniya Bharathiyar was my role model as a child. He had very modern ideas for society, and women in particular. I admired his writing and aspired to be everything he said a modern woman should be. As I describe in the book, my aunties were a great influence too, as they were intelligent, fierce and independent Jaffna women. Q: What made you join the LTTE in spite of dangers? A: Many pages in my book are devoted to explaining how my life changed from being relatively normal to witnessing some terrible things only war can bring. For me, it was a gradual process of disenchantment with the way things were unfolding around me, things I had no control over. I was only a child and I thought I was going to be killed randomly for no fault of my own. I had two options as I saw them – fight or flee. I chose the former, as many other young people did. You believe you can change the world at that age. Q: The LTTE recruited children to fight and even they used them as suicide bombers. As a child soldier, how do you view the outfit’s child conscription? can’t answer specifically about the LTTE. It’s commonly agreed that forcible recruitment of anyone, let alone children, for any kind of abusive act is not acceptable under any circumstances. Q: How do you describe Jaffna under IPKF and the LTTE’s relationship with India then? A: I was only young and a low-ranking newly recruited foot soldier at that. I didn’t know much about LTTE’s relationship with India but simply followed orders. Although Jaffna under the IPKF seemed ideal to start with, after the war broke out between the IPKF and the Tigers,it became an utter nightmare. Q: Did Prabhakaran have faith in an Indian intervention? A: Obviously I can’t speak for him but the fact that the LTTE ended up fighting the Indian forces in Jaffna may indicate to any ordinary person, that he didn’t. Q: You are one of the few who had connections with Prabhakaran, who made youth die for his cause. What do you think of him? A: Many have had much more contact with Prabhakaran than I. In my limited encounters with him, I thought him very charismatic. I guess it is his charisma that made many including me, follow his leadership. Q: The LTTE destroyed the country’s most distinguished Tamils. What are your comments about the LTTE’s stance to silence those who crossed its path? A: As many reviewers have accurately pointed out, my book is an impartial account of what I witnessed during my time in Sri Lanka, warts and all. The long civil war claimed many people who could’ve contributed greatly to humanity. We like to see real life play out like movies, where there are black and white characters of villains and heroes, but civil war is simply a nasty business where the moral compass goes missing from the start. Q: Women give a human touch to every society. What is your view about the outfit, which made helpless women to become suicide bombers? A: In my time, there were no female suicide bombers. There was only one male suicide bomber, Capt. Miller of Nelliyadi. Many of my female comrades wanted to become suicide bombers of their own will. They thought it was the highest sacrifice they could make for their people’s freedom. It is terribly sad that so many lives were lost in this horrific manner. Q: You have written the Tamil Tigress after two decades of silence, since you left the Lankan shores. What really made you write your saga and why did you not think of this while Prabhakaran was alive? A: When I left Sri Lanka over two decades ago, I didn’t carry the baggage with me. I left it for good and had no interest in Sri Lankan politics and did not follow and developments there. After the war ended in 2009 and Sri Lankans began to arrive in boatloads in Australia, it was in our local news everyday and still is. I realized many Australians had no idea of what the civil war was about in Sri Lanka and I thought telling a personal story would give them an insight. And of course, the opportunity presented itself at the right time. Q: If you compare the Tamil militancy during your stay in the LTTE and after, what went wrong with the LTTE for its defeat? A: When I was part of the outfit, it seemed like a disorganised and chaotic band of young people who could have been defeated easily. But of course, they became very powerful. I can’t say how it all came to such end, as I wasn’t there and hadn’t followed the rise and fall of the Tigers. I’m sure that there are many experts who could shed light on this. Q: Do you still believe that Tamils need Eelam? A: I don’t live in Sri Lanka and may never will, so what I think does not matter. Being an idealist, I like to see a utopian society where every person, regardless their ethnicity, gender, position or belief, is valued equally. Q: Even in the absence of Prabhakaran and with the defeat of the LTTE, some still cling on to the idea of Eelam. Do you think they will be able to mislead others again? A: Good question – one that is best answered by the Tamils living in Sri Lanka. Q: As a member of the Tamil diaspora how do you see their contribution to make the lives of Tamils, who suffered in one of the worst battles in the recent history, better? A: I see myself as an individual who can make a small difference to the suffering of post-war survivors. I donate part of the proceeds from the book to the education of war affected children and I also sponsor. It is up to each one to do what they can, big or small to make a positive difference. Many from the Diaspora are already contributing enormously to uplift affected lives in Sri Lanka and build ethnic harmony, which is to be highly commended. Q: Though some still level some allegations about the post conflict development, most of those who visited the North are convinced when they see the ground realities. How do you see the post conflict development in Sri Lanka as an outsider? A: Not having visited Sri Lanka myself, I cannot speak from a personal point of view. As you say, those who see it for themselves are better equipped to judge. Q: What do you think of the ex-LTTE cadres, who are still being rehabilitated and others who have already been reunited with their families? A: I truly hope that the physical and emotional scars they carry will heal over time and they can lead constructive lives, just as I have. I hope too, that they are given all the support and the compassion that they deserve through this difficult phase of transition. Q: Do you regret that you were misled? What was the biggest lesson that you learnt as an ex-Tigress? A: As I mentioned earlier, my friend and I joined the Tigers voluntarily. After witnessing the horrible effects of war, including the death of my best friend at such a tender age, I learnt it the hard way, that a life of violence was not for me. I concluded as the American novelist Tom Robbins did, ‘There are many things worth living for, a few things worth dying for, but nothing worth killing for’. Q: Once you mentioned that you wrote your book after seeing boat loads of Tamils fleeing Sri Lanka. Why do you think they take such risky journeys and do you see any involvement of the LTTE remnants in smuggling them to Australia and Canada? A: Having spoken to a few of those who took the treacherous journey around 2010 to Australia, I understand that there certainly was a perceived fear for one’s own safety and for their family’s which was their reason for fleeing. As to who is involved in the smuggling operation, I have no idea. Q: Some question the authenticity of the story in your book. How do you respond to this allegation? A: Many have dispelled these myths. I trust in the intelligence of the readers – to read the book with an open mind without agendas and to listen to my many interviews and make up their own mind. Q: How do you see your life as a writer now and what is your next challenge? A: I don’t consider myself a writer but as someone who shared a personal story with those who want to know. My challenge is to appreciate life everyday by doing simple things that I love – it’s a cliché I know, but tomorrow may never come. Q: Though you have adopted a pseudonym, from your picture people know who Niromi is. Do you still prefer to live under your pen name? A: I wrote under a nom de plume which gave me a chance to honor the memory of Richard de Soyza, whom I watched read the evening news on Rupavahini while I was growing up. I have great respect for journalists and the difficulties they face to bring us the news. I will continue to keep Richard’s memory alive. Q. What would be your message to the world?